That'd be true (well, kind of) if we were certain the w series winners is THE best woman driver. ... and if there were equal numbers of women and men in racing. Edited by E1pix, 08 February 2019 - 21:12. From what I know, I think Jamie Chadwick is going to walk it... Of all the entrants, she is the only one who I was surprised entered this, I thought she may be "above it" so to speak, but $500k for a few hours work can surely help her in future I suppose. When asked about it, Chadwick commented: "I'm a racing driver and, if I could, I would race 365 days of the year. I will still race against men in other championships but W Series is the perfect supplement to help me develop and progress further through the junior motorsport ranks." Reflects my own view as a spectator. (Not that she's consulted me). The series may or may not be a brilliant idea, but there's no way I'd miss my local round. F3 cars, Brands GP circuit, several race winning drivers, count me in. PS I'll bet you one can of Rich Energy that Alice Powell beats Jamie Chadwick overall. Edited by Sterzo, 08 February 2019 - 21:09. Running as DTM support is also a great benefit, because there will be a large contingent of racing world personnel, big decision-makers, three manufacturers and sponsors at the venue already. If a few of the W-Series drivers put down impressive performances (and they WILL be watched), it's a great way to gain exposure, make contacts, gather sponsors, etc. - may even land a DTM drive in the process. Edited by maximilian, 08 February 2019 - 21:47. Female drivers have consistently been a part of DTM for years, sadly other than Ellen Lohr, none have really made an impact. IN fact the Germans are probably the most advanced in this field, Audi, Isolde Holderied won tons of stuff fro Toyota and Mitsubishi, and their DTM links with women are self evident. I think the title will decide between her, Visser and Garcia. Chadwick is becoming very impressive in her own right. I know it's a long shot but I'd love her to get to F1. Edited by messy, 11 February 2019 - 14:04. 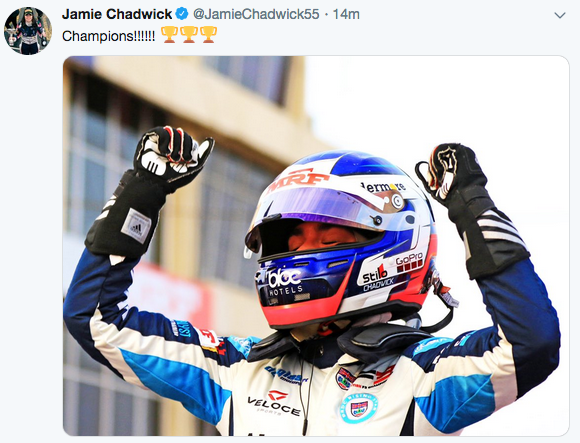 Chadwick is pretty good but wasn't a match for Lundqvist, Caroline or Kjargaard in British F3. (Oh, and we should add Monger to that list). Let's not mention F1. That's one cool thing about this Series. None of us really knows who will shine brightest -- as these ladies have never raced each other. And the new-spec F3 cars are brutal compared to past genres of the class. So is this series equivalent to F3/GP3 or below? Where should the winner go? To F2 or F3? Hailie Deegan just won the Vegas NASCAR K&N series race. She will also do some of the ARCA races this year. I feel she is the most promising of the female crop right now. Any relation to Major Deegan? She's fast on ovals, but that's one compromised path to F3 unless a *very* special driver. I know she also does Off-road truck racing aswell. It would be cool to see her try single seaters/karts, but I doubt it will as more money in nascar for her. She seems set on oval racing, like (too) many do here. Hello, I'd like to help motorsport fans to know more about the 28 drivers before the 4-day tests this week in Spain. So, I already done in French a free PDF (made with Scribus) and I translated it in English. Edited by ArcticRacing, 21 March 2019 - 12:25. Pouvez-vous nous tenir au courant de qui va de l'avant et qui échoue? I sense a recurring theme in the "minus" category, and suspect that a few of the drivers will be significantly ahead of the rest. Great piece of work, ArcticRacing! There a wide span of experience and age. One thing is for sure, all drivers will be very, very eager to do well and mistakes will be costly. That's a brilliant guide, ArcticRacing. I shall refer back to that during the season - and wouldn't be surprised if some of your paragraphs find their way into race programmes! Just read the guide, good effort! Some puzzling selections in there, such as a 32 year old with no racing for 6 years or full season in 10... I guess this is the problem W Series are trying to solve. Thanks everyone, glad it could be useful! One plus point about the series is that they're running the selection process behind closed doors, like the McLaren Autosport Awards. Any suspicion this was going to be some tacky reality show has been allayed. We won't see Coulthard telling a teary-eyed racer she's fired because she "put too much energy through the ty-res." Hats off to you, ArcticRacing. Great job. Amazing. Informative and nicely formatted. Good luck Natalie and Sabre!! Come on, she can't be any good at racing on top of that. It would just be too much. Hoping to see the W Series at the British DTM round this year. Going to give it a chance, throw some support Chadwick's way. She won't replace Legge as my #1 woman in motorsports though, nuh-uh. I was joking, you know. Just disguising my dropped jaw when I saw that picture. And besides, she's way above what handsome means for men. In my subjective opinion at least. Unfortunately, this picture rather sums up the problem of women in a 'men's' sport. Would you ever get a picture of say, Valterri Bottas, or Max Verstappen posing like this? Someone will now produce such a shot, I fear, but you get my point, I hope. Female drivers will never be given their proper degree of respect if some of them persist in posing like this. Now, she is certainly a very attractive lady, don't get me wrong, and it is a lovely picture but to my mind it just sends out the message "Hello, boys, look at me!!! ", not "Watch out boys, I am quicker than you"
I'm not convinced some pose like this because of want more than need -- and that is a factor in why this Series is so direly needed. If the series is successful at blending genders, we'll never know what's under the Nomex. And that would be great. I get your point, but the fact you know yourself there are pictures of men drivers posing does mean it's not much of a point, I'd say. I'll spare us names and pics in order not to derail the thread further. As enjoyable as that picture is, I worry that the message sent out is going to unintentionally be, "you have to look like this to be successful" rather than, "you have to drive like your name is Louise Hamilton to be successful". Having said that, I'm also an advocate of the "if you've got it, flaunt it" point of view. I'm assuming that's from her personal promotional material rather than the series. Fair enough from her and her management. Shouldn't be coming from the series itself. That's a fairly old picture of her, I've seen it in her GP3 days. Still I refuse to name names or post pictures of male racing drivers showing up their bodies and/or posing in fashion mags. Well, that's good. I don't want to see them particularly, but fair enough, if you tell me that they exist, I believe you. The question is how prevalent is it for male drivers compared to female drivers? Seems a weird thing to refuse to do. Even just naming names.